There was an option from Puerto La Cruz, head straight for Grenada or try to make Margarita in the light and anchor for the night since it was virtually right on the way. We made good time and anchored just as the sun was setting to get a good night’s sleep before the remaining 140nm run, right against the wind, to Grenada. In the morning there was very little breeze at all. Tried to sail but with 5 or 6kns wind tacking against the current was not working so on went the engine. Well much better to motor into a light breeze than tacking into a strong one. It stayed that way for 110 miles. 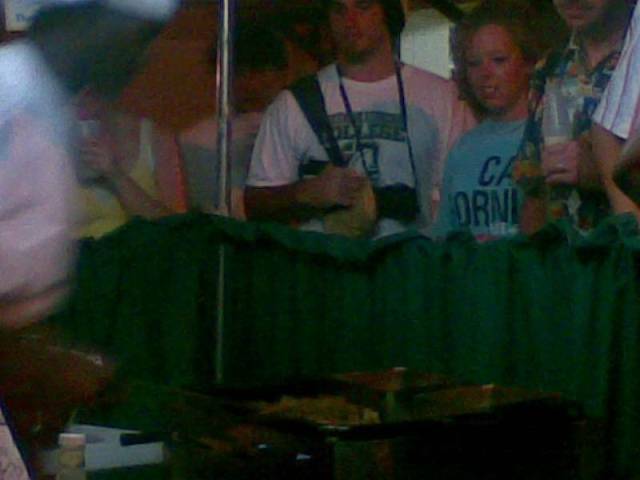 On the last sunset of 2008, in the open Caribbean Sea, we saw out most dramatic green flash yet. It was the third one we had seen but this time as the sun sunk the light turned from orange to emerald green to a bright turquoise, just stunning. We took it as a good luck omen for 2009! With 30nm to go the wind finally came up, albeit against us, to around 20kns so we put in two tacks to sail almost right into the Prickly Bay anchorage Grenada to join a hundred or more other cruising yachts. As we entered who should we see but Jan and Rich on Scorpio with whom we had sailed from Honduras to Panama. Catching up to be done over a few beers! There would have to have been well over a hundred yachts anchored in Prickly Bay most apparently coming up from Trinidad where they spent the hurricane season and were now heading North up the East Caribbean island chain. Many Americans leave their boats in places like Trinidad and Venezuela for the hurricane season while they go home to return later and cruise the Caribbean islands again. As usual things to do items, not found in other places to be bought. It is amazing how fast the time just disappears. 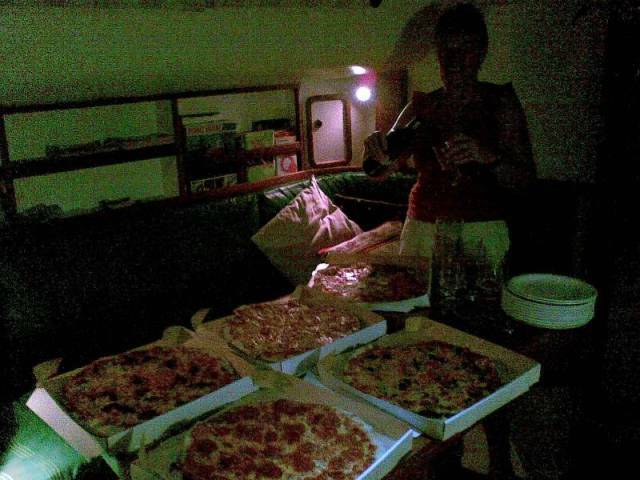 The third of January was Jan's birthday so into the bar for happy hour after which the gang, 10 of us bought pizzas and back to Scorpio for the birthday, booze and pizza, a great night had by all. We were keen to do a couple of things we had heard about, and island tour, with only 334 square kilometers, a one day event and go to the fish fry. A local tour operator, Cuttys Taxis and Tours had a good reputation so, with Jan and Rich, met Cutty, a Grenadian native, on shore at 9am and, with 8 others, set of in his minibus. 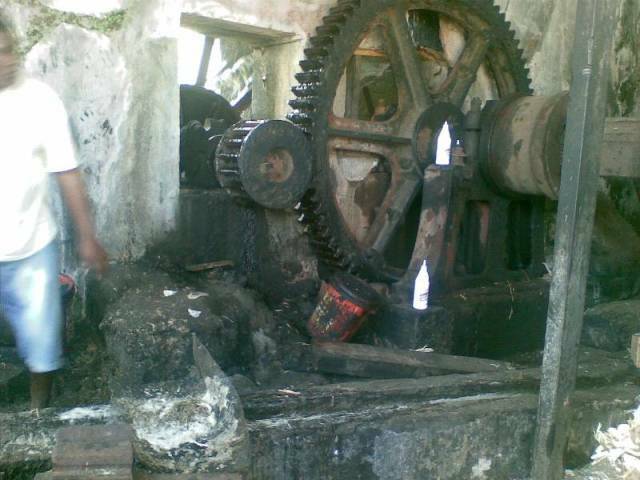 What a wealth of local knowledge, especially in relation to local spice plants. Every now and then Cutty would stop, jump out and get a fruit, leaves or bark of a tree for us to sample, some better known ones, cinnamon, bay leaves and nutmeg but also many, many others. Lunch was served by Dr Thompson at Morne Fendue Plantation House, built by a Scottish plantation owner in the latter part of the 18th century. Dr Thompson also gave a historical rundown and a tour of the house, once magnificent but now somewhat rundown, still with superb views of the ocean far below. 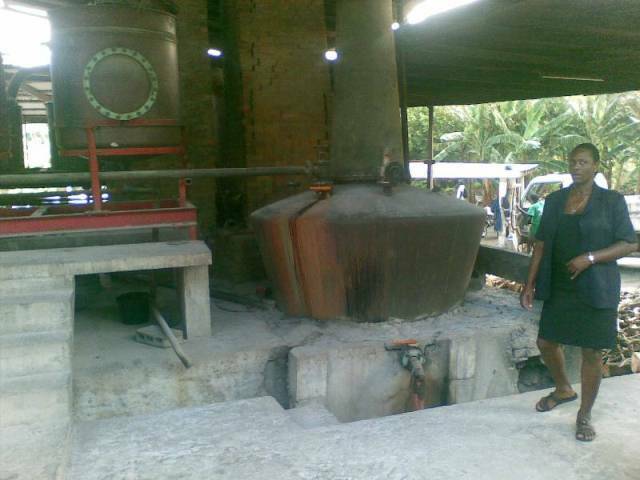 Next stop the much awaited rum distillery still producing using the same machinery as it used in the late 19th century. 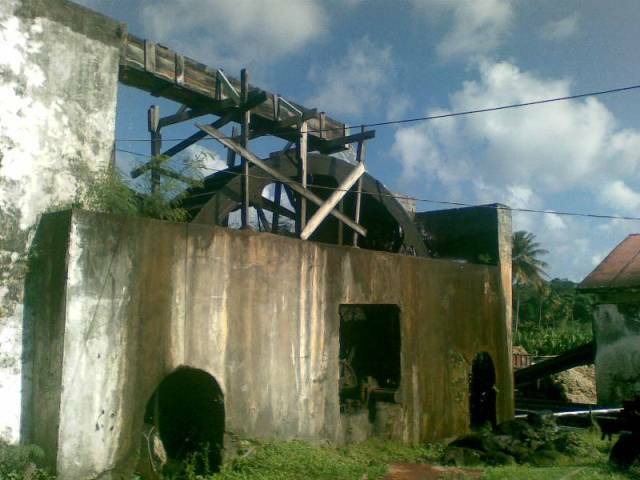 A huge water wheel propels the distillery, primarily crushing the sugar cane grown right next door. 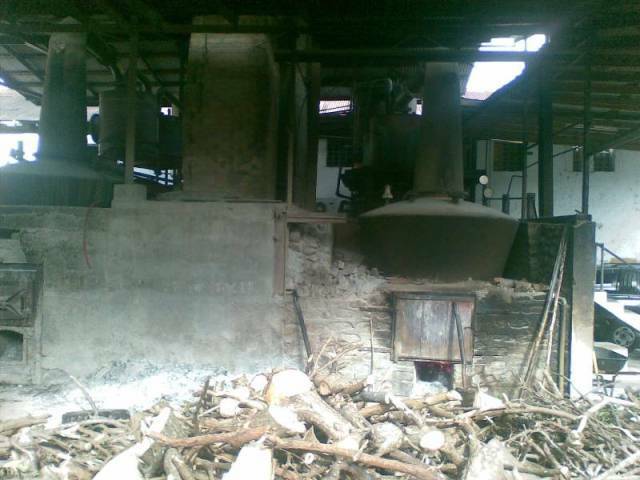 Remnants of the crunched cane are then used to fire the huge pans that heat the cane juice before it runs into vats for fermentation. Finally, after fermenting where it reaches 10% alcohol, it is distilled. 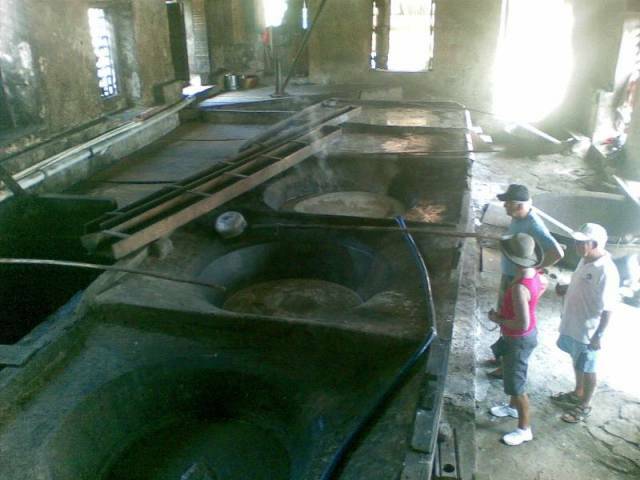 After distillation it is tested and if not at least 75% alcohol (over 150 proof) it is recycled through the still! All done by hand, no automation here. And the product, all sold locally. Of course we sampled and had to buy a bottle, a whole $10. We were told "you cannot take their rum on the plane as it is too flammable"! To overcome this they also had a 69% alcohol "watered down" version that you could take on the plane. Not that it worried us. 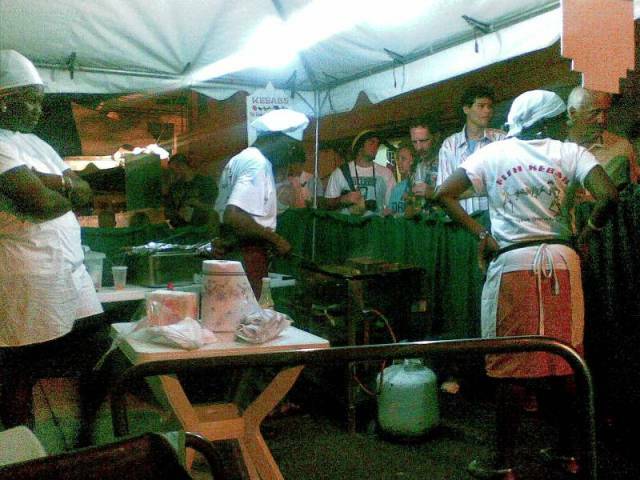 On Friday night it off to the Fish Fry in the village of Gouyave, an event put on almost by the whole village with 30 or 40 individual stalls selling fish of all sorts cooked every way imaginable. Impossible to taste them all but we had a good try, washed down with beer. 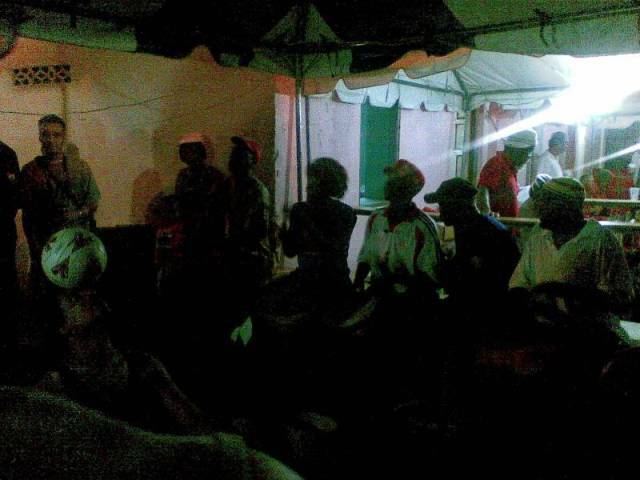 Entertainment, apart from the stalls, was a local drum band all in reggae rhythm. Saturday morning, 10 January 2009, at 6:30 we lifter the anchor for the 38nm route, again against wind and current, North East to the island of Carriacou. 11 1/2 hours and 60 sea miles spent tacking in a lovely 20kn plus breeze; we made it into Tyrell Bay. En route we had to dodge Kickem Jenny, an active volcano, under water. It rises 4,000 feet from the sea floor with the rim apparently 600 feet below the surface. Last sub sea eruption 2003 but you wouldn't want to be sailing over the top of it if it did go off, hence the 1 mile exclusion zone; doesn't seem a lot. It must be remembered that the Eastern Caribbean chain of islands was formed from volcanic activity; they are the tops of an underwater mountain range rising 4,000 meters from the ocean plain floor. Carriacou is part of the country of Grenada so no checking in to worry about, just the check out before sailing another 10 miles to Union Island, part of the Grenadines. Carraicou didn't seem to have a huge amount to offer but at least swimming in clear water again and some comfortable walking. The anchorage was crowded, a hundred or so yachts again and rolly from the swell coming into the bay, fairly uncomfortable so we soon moved to the tiny Sand Island, protected from the swell but open to the continuous trade winds. Best of all only a couple of other boats a white sand beach and clear water. We swam to shore and walked the sandy, almost white, beach and snorkeled over the coral. Did I say coral, might have been many years ago but now just dead coral rocks and weed making a very ordinary reef. Next morning we went into Hillsborough for customs and immigration to check out before sailing off to Union Island, the Southern most island of the island group country called Saint Vincent and the Grenadines. What a difference people make, when we checked into Grenada the customs guy in particular was so welcoming and jovial; both the customs and immigration guys treated us almost with distain. A few tacks and hours later we were anchored off Clifton, Union Island where we checked in at the airport, no problem. For some time I had been looking for a wood turner to get some new fishing lure heads turned up and, according to our guide book there was an Aussie "do anything" guy here who might be able to turn wood or plastic. Now Clifton is not a huge place, one main street so it didn't take long to find Castello Steel Works, not really a steel woks but more an arty sort of outfit, but alas no Aussie, Lionel Fox, he had left for Oz yesterday, bugger! Not a lot in Clifton, the attraction for us was the famed Tobago Cays just a few miles to the North East, yes again into the wind and current. We were up early morning for the leisurely sail to the Cays. The current was running over 2knts right on the beam, pushing us sideways, making our course over ground (COG) over 30 degrees worse than Ednbal's heading. When tacking or "beating" into the wind we usually get to about 50 degrees true course reasonably comfortably so that when we tack we zigzag at about 100 degrees towards our destination. If you then add over 30 degrees, let’s say 40, for each tack change you get 100 plus 80, all you do is turn 180 degrees and go back the way you came, most disheartening to say the least. We motored the rest of the way, all of 2 miles. Tobago Cays is a much regulated National Park, maximum speed of any vessel, 6kn, anchoring only in one small area, no load music, no noisy wind generators, etc, etc, most of which everybody seemed to ignore. We anchored away from the crowd, outside of the anchoring area away from the 40 or so yachts crammed into the tiny anchorage area. The water clarity and snorkeling were only average, nothing like the hype of the cruising guides or local tourist brochures. Never the less we spent a lovely few days swimming and just chilling out generally. From Tobago Cays we headed East of North, again pretty much against the wind and with a big current abeam just to increase the degree of difficulty in sailing. After sailing to the west of Mayreau our course was about 40 degrees to the Western tip of Canouan, around and into Charleston Bay. As the guide book says "Canouan is an island of bumpy hills, spectacular views and exquisite water colours". Not wrong, we fell in love with the place, first time we had not seen barred windows and doors for over a year, friendly people, all the things that come with a small town where everybody knows everybody. Walking was a pleasure, very few cars and lovely clean air even on the roads. It is unlikely to stay that way too much longer, the Northern half of the island is being developed by a huge consortium lead by Donald Trump, you can by a small villa starting at $4 million US!! For our next stop we decided on a small out of the way, uninhabited island called Baliceaux. Again into the wind. Our first tack took us a little West of North (course to Baliceaux was about 40 degrees), out over the shelf into deep, over 1000m, water so in came the minnow lure and out went the skirted lure, ideal when sailing at 7kn through the water. We had been told many times about the lack of fish in these waters but within 10 minutes the reel was screaming. Very tricky landing a 10kg or so Mahi Mahi when sailing close hauled with 20kns of breeze. With the dingy up on the transom there isn't much room left to haul a decent fish on board let alone when the boat is heeling. Ric, the autopilot, looked after things while Sasha and I fumbled around trying to get the fish into the cockpit without getting hooked or losing it. With the aid of rum poured into the gills the fish went very quiet and we managed to get it in without injury or damage. Beautiful fillets, fish frames for the bbq and head for fish soup, at least 12 individual meals out of one fish. After sailing over 40nm to get 20nm as the crow flies, we anchored, with just one other yacht, just off the Southern end of the tiny Baliceaux. It was rolly, just an island, maybe a mile in diameter, not much protection from the full Atlantis swells. In the morning we swam ashore, the waves were a bit big to risk the dingy on a rocky shore. A lovely walk on a hilly deserted island, void of people but with cattle and chooks so people must attend from time to time. We even saw a tiny tortuous. From Baliceaux a lovely down wind sail, for all of 5 miles to the very touristy island of Bequia and the main attraction for us, the 3 day Bequia music festival. This time another big, busy anchorage in Admiralty Bay. 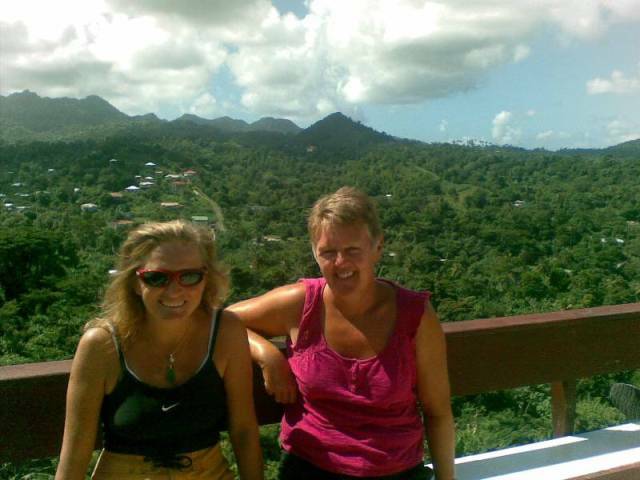 Bequia is another island of the country Saint Vincent and the Grenadines so no checking in to worry about. Even 2 other Aussie yachts, nice to chat to fellow countrymen now and again. Our cruising guide made reference to some interesting walk trails so one morning we packed a picnic lunch into the picnic back pack that Grant had given us and headed off for Hope beach on the other side of the island. After a couple of wrong turns we found the beach then decided to "bush bash" our way up a very steep hill from the beach towards where our map indicated was a road. Good plan, execution not so easy! After a few catch your breath and footing stops we made it to the ridge and the far less steep wooded ground to try and find the road. We had seen some pretty flash houses on the top, from the beach but didn't realise the extent of their properties and fences, finding the road was not so straight forward. Even so it didn't take too long to follow one of the fence lines and come out, right where some guys were building a new fence, along the side of the road. They were quite surprised to see us, not sure how we got there but were good natured about it and gave us a few hints on places we could go for our picnic lunch, none of which, I might add, we found. Lunch was on the side of a very small road with a spectacular view of the ocean spreading to the East with Mystic Island in the background. When unpacking lunch a major problem was discovered, I had packed the drinks, beer, tonic, ice but had forgotten the gin! We met up with a couple of Aussie boats and have a drink on one with Bruce and Wayway. Bruce gave us some feedback on our next planned anchorage, Chateabelair on the island of St Vincent. Apparently due to vessel boarding’s, with violence, no yachts were going there at all. Our plan was to stop there as it is close to a very good trek up Soufriere, a 1000m high volcano. Any thought of stopping at St Vincent rapidly evaporated. The Bequia music festival was a relatively quiet, much laid back, affair with "jump up" but then again you can't expect too much from a small island. Oh and jump up, that is the term for dancing in the sand, you tend to jump rather than slide. It is even advertised as such and such with jump up! With a forecast of strengthening trade winds in a couple of days we decided, immediately after the end of the music festival, to head for Martinique, 92nm further North, North East. Easiest way was to make it an overnight trip, leave after breakfast and, allowing for tacking with arrive sometime the next day with 15 to 20kns forecast. It seemed the weather change came a little earlier, a few squalls during the day but pretty much one after the other during the night. One minute we were lucky to have 10 kns, the next we had gusts of 25 so sails were reefed and we oscillated between barely moving and heeled almost with a gunwale in the water. Then at about 3am we had a visitor, a large flying fish, maybe a foot long, landed in the cockpit flapping around in rainwater. I managed to get it back over the side but not become it left a lot of scales. For days after scales turned up all over the place in Ednbal.